We also have with us rich industry experience in successfully matching up with the demands of precision designed as well as engineered Tyre Air Inflators. These mechanical handheld units incorporate clear analogue display and are designed to provide excellent level of accuracy. These are used in high volume applications like Tyre shop, Garages and Depots. · Suitable for indoor applications. 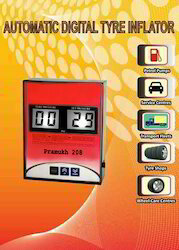 · Economical unit designed for Wheel Care Centers, Service Stations, and Tyre Shops. · Dual Super Bright LED Displays. · Compact Wall mount design. · 10 meters Coiled Hose with Clip On Lockable Tyre connector/Air Nozzle. Inlet 4mtr, Outlet 8mts, Filter to Machine 1mtr = 13mtr. Looking for Tyre Air Inflator ?